It’s been written that Baseball is the perfect game. Today it allowed everyday heroes to stand center stage and take bows that will be remembered for decades. 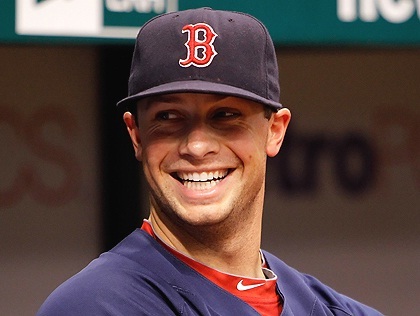 Daniel Nava, occasionally familiar with a dramatic homerun, bailed out Clay Buchholz and the non-clutch David Ortiz with a 2-out, 3-run homer in the bottom of the 8th. His bash into the Sox bullpen was caught expertly by teammate Junichi Tazawa. It drove in the winning runs in the first Fenway game after the bombing of the Boston Marathon. Nava put a fine swing on a 1-1 change-up, depositing it in about the same spot as he did another of Mr. Selig’s spheres on June 12, 2010, when he hit a Joe Blanton pitch to become the second player to ever hit a grand slam home run on the first pitch he was thrown in the majors. Before that debut game, Johnny Pesky told Daniel that anything could happen in his first upcoming at bat. Still, Nava wasn’t swinging for a homerun 3 years ago, and he wasn’t swinging for the fences today either. Nor was he swinging for the big bam on April 8, when his homerun won the 2013 Red Sox home opener. Ironically, that’s when it happens for Daniel. When he just swings to make contact. Baseball success has largely eluded Nava since he was a kid. Nava was just 4’8 ” tall and weighed 70 pounds as a high school freshman. He grew to 5’5” and 150 by age 18, but could not make the college team at Santa Clara State. Thus, he became the Bronco’s equipment manager. A successful stint as a junior college player later earned him a scholarship in a return to Santa Clara, but he went undrafted by the pro’s. He had to play independent league ball to continue his dream after college. The irony is that the man who came through when the city needed it today is the player that nobody wanted. He is the player that spent each of the last 6 seasons playing in the minor leagues while getting just 484 at bats in sporadic stays with the big club. And the day, this day, that Nava honored Boston, the Red Sox honored on field other unrecognized heroes. Heroes that wear a cap and badge for Watertown, Boston and the Staties. Heroes that are everyday citizens. People who run toward the trouble when hell breaks out, not away from it. Mr. Nobody came through today, a day that capped a week of terror, heartbreak and relief. Or should I say that it MIGHT have capped it ? We don’t know what the 30 year old pride of Mountain View, CA will do for us tomorrow. Daniel has mojo. Daniel is the Talisman. Kevin “I’ll always be a Red Sox” Youkilis, now a Yankee, sports a .295 average currently and has had some timely hits. No surprise that he doubled in the winning run today against the Jays. Also no surprise that he left the game early with tightness in his back. Yankee fans will learn what Sox fans already know about the wear and tear on Kevin’s body. Youk is Mr. Emo. He plays all out. He gets hit, scraped and scuffed. Youk is a warrior in April and May but will limp to the finish line in August and September. No criticism intended. Like former Yankee Paul O’Neil, Youk plays one way. His intensity is a double edged sword. Derek Jeter is banged up. There’s a fracture in the bone that was operated on last year. Is this the end? Will he ever again present a reasonable facsimile of his old ability? Perhaps not. When the time finally comes for farewells, I’ll remember Jeter for his durability. The home run he hit for his 3,000th hit was royal. His 2004 nose bloodying dive into the stands ennobled him. His patented fall-in-liner started or crowned many a rally. His batting stats are princely for a shortstop (.313, 255, 1254). He is almost the King of Shortstops with 2,531 games at SS in 18 years. In that count, Jeter is slightly ahead of HOF’er Ozzie Smith, slightly behind HOF’er Aparicio, and 178 games behind the all-time leader, future HOF’er Omar Vizquel. Jeter was tip top for a very long time. He is a first ballot HOF’er. He would have looked great in a Boston jersey. Derek Jeter for Scott Cooper in 1994. I think the Yankees owed us that much. This entry was posted on April 21, 2013 at 12:35 am	and is filed under BASEBALL, Boston Red Sox, NEW YORK YANKEES, RED SOX. You can follow any responses to this entry through the RSS 2.0 feed. You can leave a response, or trackback from your own site.